Now this is what you call ‘proper’ spy kit. A ring with a camera in it to take pictures of suspects at a party. There is little more to add. 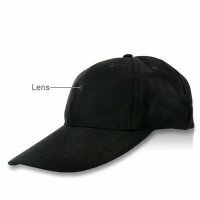 A Spy Cap with built in hidden video recorder that can be paired with your phone to dial/pick calls hands free. Its dimensions and weight are similar to caps sold in any shop. This is mainly due to the extremely small pinhole lens camera which is hidden within a rivet in the hat. So even if people are looking directly at the cap, they won't notice anything! The shop below stocks many other types of spy camera. Mini Sport Digital Video Camcorder - Black - Camera Only - WORLD'S SMALLEST VOICE & VIDEO CAMERA! !